The Countryman E6 Flex Omnidirectional Microphone combines the springy, form-fitting ear grips of the E6, with the flexible and durable boom of the E6i earset microphone. The E6 Flex provides virtually invisible operation in stage performances, trade shows, houses-of-worship, auctions, lectures and much more. The omnidirectional pattern is the most versatile and features a wide pick up area while minimizing extraneous noise. Flexible microphone positioning is maintained, and the included windscreen minimizes wind noise. A wide variety of colors and connections are available for use with various wireless transmitters. This version is black and the cable terminates to a Switchcraft TA4F connector for Revolabs wireless transmitters. A miniature cardioid capsule is mounted to a low-profile, flexible frame. 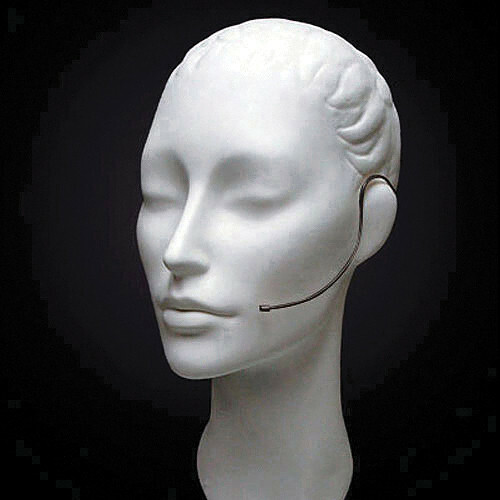 This lightweight, unobtrusive design is available in various colors that virtually render the entire microphone invisible against the skin. The included removable, quick-swap cable detaches from the actual headset, making it completely replaceable in the event of a short or break. The replaceable cable design makes upgrading wireless microphone systems easy, as they are available in a wide selection of connections to accommodate various wireless transmitters. The omnidirectional polar pattern is the most versatile pattern for accurately capturing any source. A generous pick up area is forgiving during imperfect microphone placement. The pattern also minimizes extraneous noise. The flexible boom provides a stiff fit that maintains its shape for single user applications. The E6 Flex is also available in a cardioid version for maximum off-axis noise rejection in environments with high feedback and noise. This E6 Flex's sensitivity response is optimized to accurately capture both general speech and vocals without noise and distortion.